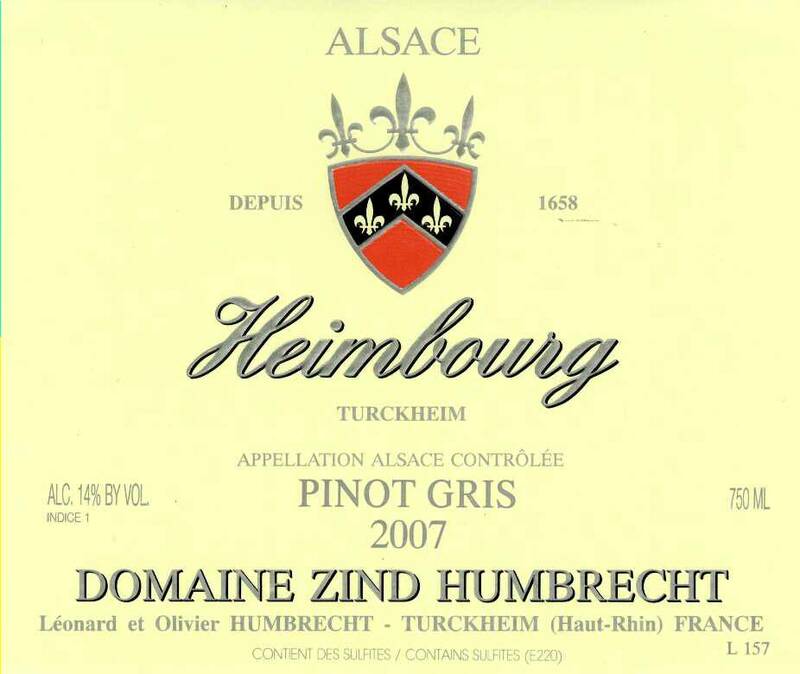 The Pinot Gris is planted on the top west facing part of the Heimbourg hillside. Just like the Rotenberg, it enjoys slow ripening conditions and usually produces very small crop, because the calcareous soil is very rocky and poor in organic elements in this area. The Heimbourg vineyard was also our only vineyard that was on the edge of the terrible hailstorm that decimated the Bennwihr/Mittelwihr/Sigolsheim area mid-June 2007. We lost around 40% of our potential crop in a few minutes. Fortunately, the storm didn’t progress to the neighbouring vineyards of Brand or Clos Jebsal or the rest of the Heimbourg! There was of course no impact on quality because the grapes were just finishing flowering, but the vines were shocked! In order to avoid reducing to much the yields, we decided to harvest these small surviving grapes earlier than usual, completely healthy. The result is a wine that was able to ferment to the end completely dry. We like the result a lot, and this has opened our minds to different options for this vineyard. 2/2009: at first quite closed, this wine has now gradually opened up on the nose. It shows smoky, nutty and almond flavours. The minerality of the calcareous soil shows well. The palate is really very dry, enhanced by good acidity and a nice power. This wine demonstrates how a very low yield can compensate higher alcohol richness. It definitely needs more time.